This study was designed to analyze the effects of iron overload on antioxidant enzymes and liver cell damage in β thalassemia major patients undergoing regular blood transfusion. Patients with confirmed diagnosis of thalassemia major on regular blood transfusions were enrolled, consent was taken and a proforma was filled. Thalassemia intermedia and minor cases, or those with ferritin level less than 1000 ng/ml and/or taking any vitamin supplements, were excluded from the study. Blood from thalassemic patients was collected just before transfusion. For comparison, control blood was drawn from healthy individuals not exhibiting any signs and symptoms. Ten milliliters of venous blood was collected just before transfusion from the antecubital vein under aseptic measures. Whole blood was taken simultaneously in lithium heparin and EDTA tubes. Serum was separated within 1 h. Sample in the EDTA tube was used for automated hemoglobin and hemotocrit estimation on a Beckman Coulter automated hematology analyzer MaxM (Beckman Coulter Diagnostics, Switzerland). Whole blood sample in the lithium heparin tube was used for estimation of GPX and SOD. For rest of the parameters, aliquots were initially stored at -50°C. The data was entered into statistical package for social sciences (SPSS) version 16.0 and was analyzed using Student's independent samples t-test and Pearson's correlation coefficient. GPX assay was performed using Ransel GPX and the results were read on a spectrophotometer, model AE-350, Erma Inc., Tokyo, Japan. SOD was assayed using the Ransod kit and the results were read on a spectrophotometer; model AE-350, Erma Inc. Tokyo, Japan. Serum ferritin was analyzed by the enzyme immunoassay method using the kit of Pointe Scientific. inc. 5449 research drive, canton MI 48188, USA. Total and direct bilirubin, AST and ALT were measured in serum using Randox kits. Serum Tocopherol was determined by the Baker and Frank method, 1968, and the absorbance was read at 520 nm. This study was approved by the departmental research committee. Forty-eight diagnosed cases of β thalassemia major, 34 males and 14 females, aged 1-23 years (mean 11.21 ± 0.68 years), were recruited with consent for this study. All the patients were on regular bimonthly transfusions of 15 ml/kg body weight at each transfusion to maintain hemoglobin levels above 10 g/dl. The mean duration of transfusion was 10.49 ± 0.69 years. Thirty control subjects (21 males and 9 females) with a mean age of 11.13 ± 0.62 years were also recruited in the study. The patient and control data is presented in [Table 1] with mean values and standard error of mean. Vitamin E level was found to be significantly lower (P<0.001) in the β-thalassemic patients as compared with the control group. GPX (U/L) was found to be significantly low (P<0.001) in the β-thalassemic group as compared with the control group. Similarly, the mean level of enzyme SOD (U/L) was also found to be significantly low (P<0.001) in the β-thalassemic patients as compared with controls. 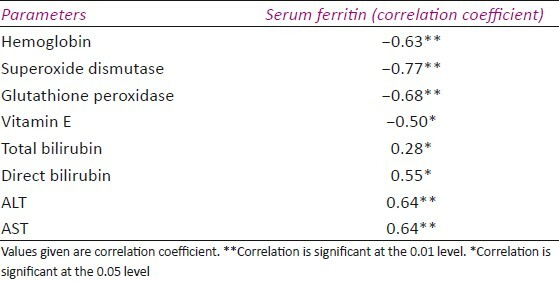 [Table 2] shows the correlation coefficient between serum ferritin and other biochemical parameters. Serum ferritin, which determines the extent of iron loading, was found to have a significant negative correlation with the antioxidant enzymes, i.e. GPX, SOD and vitamin E, thus showing increased oxidative stress. Serum ferritin was positively correlated with ALT, AST, total bilirubin and direct bilirubin, representing cell damage as a consequence of iron overload. 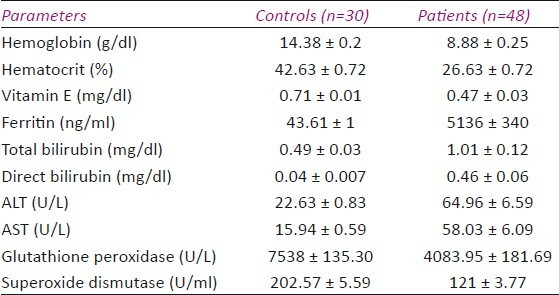 [Table 3] depicts a negative correlation between vitamin E and ALT, AST, total bilirubin and direct bilirubin, suggesting that liver damage may play a major role in the extent of depletion of lipid-soluble antioxidants. Similarly, GPX and SOD were also negatively correlated with ALT, AST, total bilirubin and direct bilirubin, showing decreased activity of antioxidant enzymes in relation to increasingly disturbed signs of liver damage. A strongly positive correlation was found between SOD and hemoglobin and GPX and hemoglobin. Thus, decreased activities of antioxidants enzymes reflect their role in severity of the disease. In conclusion, our observations (depletion of vitamin E, decreased activities of SOD and GPX and the increase of ferritinaemia) indicate that thalassemics are in a state of enhanced oxidative stress, and understanding the clinical manifestations of thalassemia major from the viewpoint of the enzymatic antioxidant defense system in diseased erythrocytes is of great significance for the future management of these patients. The authors would like to thank Dr. Walid Bin Azhar, Chief Operating Officer, Fatimid Foundation, Karachi. 1. Ahmed S, Saleem M, Modell B, Petrou M. Screening extended families for genetic hemoglobin disorders in Pakistan. N Engl J Med 2002;347:1162-8. 2. Olivieri NF, Brittenham GM. Iron-chelating therapy and the treatment of thalassemia. Blood 1997;89:739-61. 3. Reller K, Dresow B, Collell M, Fischer R, Engelhardt R, Nielsen P, et al. Iron overload and antioxidant status in patients with â-thalassemia major. Ann N Y Acad Sci 1998;850:463-5. 4. Kattamis C, Kattamis AC. Oxidative stress disturbances in erythrocytes of â-thalassemia. Pediatr Hematol Oncol 2000;8:85-8. 5. Chakraborty D, Bhattacharyya M. Oxidant defense status of red blood cells of patients with â-thalassemia and E â thalassemia. Clin Chim Acta 2001;305:123-9. 6. Walter PB, Fung EB, Killilea DW, Jiang Q, Hudes M, Madden J, et al. Oxidative stress and inflammation in iron-overloaded patients with â-thalassemia or sickle cell disease. Br J Haematol 2006;135:254-63. 7. Traber MG, Packer L. Vitamin E: Function beyond antioxidant. Am J Clin Nutr 1995;62:1501S- 9S. 8. Filosa A, Valgimigli L, Pedulli GF, Sapone A, Maggio A, Renda D, et al. Quantitative evaluation of oxidative stress status on peripheral blood in â-thalassemic patients by means of electron paramagnetic resonance spectroscopy. Br J Hematol 2005;131:135-40. 9. Scott MD, Repka T, Hebbel RP, van den Berg JM, Wagner TC, Lubin BH et al. Membrane deposition of heme and non-heme iron in model thalassemic erythrocytes. Blood 1991;78:771. 10. Dhawan V, Kumar KhR, Marwaha RK, Ganguly NK. Antioxidant status in children with homozygous thalassemia. Indian Pediatr 2005;42:1141-5. 11. Simsek, Ozturk G, Kemahli S, Erbas D, Hasanoglu A. A Oxidant and antioxidant status in â thalassemia major patients. J Ankara Univ Fac Med 2005;58:34-8. 12. Gerli GC, Beretta L, Bianchi M, Pellegatta A, Agostoni A. Erythrocyte superoxide dismutase, catalase and glutathione peroxidase activities in â-thalassemia (major and minor). Scand J Haematol 1980;25:87-92. 13. Garelnabi M, Paradhan P. Splenectomy may not influence glutathione metabolism in children with â thalassemia major. Turk J Haematol 2005;22:25-30. 14. Nasr MR, Ali S, Shaker M and Elgabry E. Antioxidant micronutrient in children with thalassemia in Egypt. East Mediterr Health J 2002;8:1-5. 15. Laksmitawati DR, Handayani S, Udyaningsih-Freisleben SK, Kurniati V, Adhiyanto C, Hidayat J, et al. Iron status and oxidative stress in â-thalassemia patients in Jakarta. Biofactors 2003;19:53-62.